Did you know that babies are able to recognize and process sounds related to language from a very early age? Infants seem to respond to sounds produced by their mother while still in the uterus. This auditory system is not fully developed at birth but is ready to function. Neonates are able to discriminate between the different sound levels and duration, different phonemes and constants of all the languages they are exposed to. However when they turn 12 months of age this ability disappears and they are only able to discriminate the phonemes of their native language. This phenomenon is explained through Jusczyk’s Head Turn Experiment. Jusczyk tested two groups of American babies aged 6 months and 9 months. The experiment recorded how long the baby looked at either the right or the left speaker when listening to a word list in either English or Dutch. The result showed that the 9-month-old babies preferred the English list and the 6-month-old babies had no preference. Next the same word lists were passed through a low-pass filter to only let the low frequencies out. This resulted in the both groups showing no preference. This concludes that 9-month-old babies are aware of the phonemes in their own language as they start to use both prosodic and phonotactic cues to discriminate individual speech sounds of their language. Why do the 6-month-old babies have no preference? Jusczyk changed the word lists to English and Norwegian because Dutch and English have the same prosodic pattern, whereas English and Norwegian do not. The results were that with or without a low-pass filter, the 6-month-old babies preferred the English list. Conclusion; 6-month-old babies are not aware of sound sequences but can discriminate different prosodic patterns and prefer their own languages pattern. The reason could be the belief that babies at birth hear at a low frequency because the middle ear is still filled with fluid and so cannot differentiate different speech sounds. 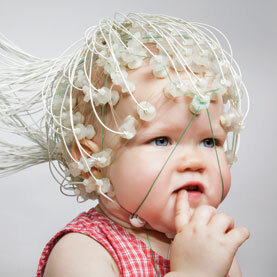 There is a vast difference seen in the auditory sensory abilities of an infant aged 6 months and a child aged 12 months. From being able to discriminate different prosodic patterns in different languages to being able to differentiate the different phonemes, eventually children reaching one year of age become better at discerning phonemes in their native language and poor at other languages. For example, Japanese speaking adults cannot discriminate the English sounds of ‘la’ and ‘ra’, whereas English speaking adults have no problem and English speaking adults cannot discriminate the Japanese sounds ‘i’ and ‘ii’, whereas Japanese adults can. However these sounds and sounds from other languages such as the Hindi ‘da’ and ‘da’ can be discriminated by an infant in the first few months after birth. In the end, infants lose this ability to start to develop language and speech as they start to form concepts and begin categorising speech in their native language.